Kickboxing is a real family affair for aspiring world champion Whitney Sheppard who is preparing for the fight of her life this weekend in Galway. The petite 31-year-old and mother of two is taking on German champion Evelyn Gallegos from Frankfurt for the vacant IKF Atomweight World K-1 title - the first time the two have met and Sheppard's first world championship bout. To do so she has spent the week "cutting weight" to weigh in for the 50.9kgs class, has continued "training like normal" in Peter Foley's Black Dragon Gym, and looked after her two daughters aged four and 11. Tomorrow is a day off as she weighs in, hoping to have lost the couple of kilos to make weight. Then, on Saturday, there is a well overdue sleep-in to help calm the nerves ahead of the biggest fight in her 17 years kickboxing. Sheppard is blessed her husband of two years Peter Sheppard is a former world champion, younger brother Paul Huish is a current world champion, and her "fearless" daughter Sofia, who is starting sixth class at Knocknacarra National School, is one of the up-and-coming youngsters appearing on the undercard at the Clayton Hotel, alongside Pete Foley's daughter Faith. It is a journey that as taken Sheppard 17 years since she arrived in Galway from Bath and started school in the Jes. "I started kickboxing at 14 - it was just up the road from the Jes. I saw a poster, just went along to see it, loved it, and have never left. "I've made some really good friends, we are like a family. We're there every night, and when someone feels tired or they are injured, we push each other along all the time." Unlike some kickboxing enthusiasts who practise to defend themselves or keep fit, Sheppard is a fighter. "I love the competitive side, I love training for something. I love that sense of purpose." And she believes the sport is for everyone. "It doesn't have to physical. You can learn it for self defence, you don't have to fight, and it's a great way to lose weigh. We have a lot of obese kids and not only is it a great way to lose weight but an interesting way because you are not soley concentrating on running, but learning something and losing weight in the process. "It's also great for confidence and [for self defence] just in case .... it's better to be safe than sorry." Her first fight, she recalls, was as a 15-years-old against a Waterford girl Jean Walsh. "It was very scary. I lost the fight, and I wasn't used to the rate she came at me. But there is no experience like fight experience. I learned so much from fighting, and what to expect because when you are sparring in the gym, nobody is going to do that to you." Since then Sheppard has taken on 36 fights, won 22, and lost 14 - for the 14 losses she was fighting at a heavier weight, and since returning to training after the birth of her second daughter Taylor and dropping to 50 kgs, she has enjoyed a winning success rate from nine fights. "I used to fight at bigger weights, 57, 55 but I found the girls were taller than me, and because I am so small, it was difficult for me with kicks. Now most of the girls are the same height, or if they are taller, they are skinnier, and so not as strong." Saturday's evening's opponent is the Spanish-born Gallegos who is also the 2016 World gold medalist. "I know she is very good, she a lot of experience, and more titles than me. She fought in big international tournament last month and won both the 51 and 56 categories. I know it is going to be non stop, she doesn't stop, so it should be very exciting." In her 36 fights do date, Sheppard has only stopped five people. Knock-out blows are rare enough with 90 per cent of fights decided by judges' decisions. As a result, she says, it's important to ensure the judges see clearly who lands the blows. Simply put, she says: "I try to hit her and not get hit so I am up on points and the judges can see she is getting more punishment than I am." Having claimed a European title last year, this first world title fight is the next step. And with all her family behind her and PeteFoley's gym, Sheppard is hoping to achieve another milestone. 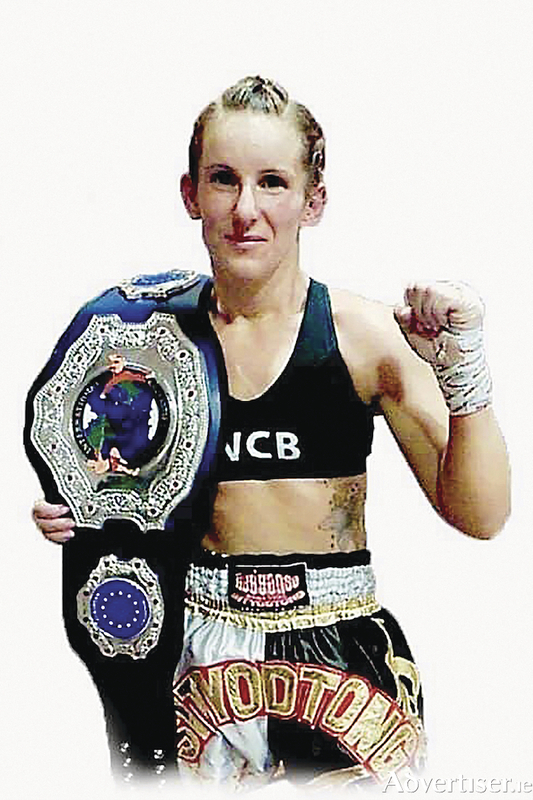 When she takes to the ring on Saturday, Sheppard, who is sponsored by Headmasters Barbers, Seabreeze Lodge Knocknacarra, and Platinum Tanning Studio, Knocknacarra, will be wearing familiar attire - a black pair of shorts. "I am not superstitious, but since I had Taylor I have worn the same black pair of shorts and won every one since. So just in case I will be wearing those again - and I have so many pretty pink pairs.."
•Whitney Shepherd's world title fight will be the main fight, sponsored by ZinCuFlex supplements, on the card at the Clayton Hotel Galway. There will be two international Ireland versus France K-1 superfights on the card also, and five all Ireland title fights and seven more support bouts. A total of 15 fights in all and of these, 12 are from the Galway Black Dragon Kickboxing Gym. Doors open at 6pm with the first flight scheduled for 7pm.